( Disorder Inquiry Committee Report, Vol II, p 197). 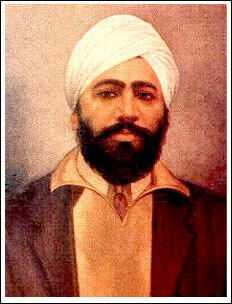 Udham Singh was 20 years at that point of time and he resolved that he would avenge the massacre . He primarily held Lt.Governor Michael O Dwyer to be responsible for the massacre of Jallianwala Bagh. The Lion moves around the world : Udham moved around the world including US and Italy and also worked closely with the legendary Sohan Singh Bhakna, the founder of the Gadar Party in the US. India’s freedom movement abroad, viz building a voice around the world was primarily the handiwork of people like Udham Singh. He was finally able to reach London in 1934 via Italy, France, Switzerland and Austria. The Lion Strikes : Despite numerous opportunities to strike, Singh awaited a right time when he could make more impact with the killing and internationalize the event. A joint meeting of the East India Association and the Royal Central Asian Society was scheduled at Caxton Hall and among the speakers was Michael O’Dwyer. Singh concealed his revolver in a book specially cut for the purpose and managed to enter Caxton Hall. He took up his position against the wall. At the end of the meeting, the gathering stood up, and O’Dwyer moved towards the platform to talk to Lord Zetland. Singh pulled his revolver and fired. O’Dwyer was hit twice and died immediately. This was on 13th March 1940, 21 years after the massacre. Living Upto A Pledge : He lived up to his pledge made 21 years back. Many of us take pledges during times of distress but then lack the patience to see it fulfil through our toil and sweat. Udham Singh lived upto the tradition of the Sri Rama who took a pledge at the age of 13 to free the earth of Rakshasas and lived upto it. His last words were equally inspirational as was his commitment to a pledge. ” ‘I don’t care, I don’t mind dying. What Is the use of waiting till you get old? This Is no good. You want to die when you are young. That is good, that Is what I am doing’. On 31 July 1940, Udham Singh was hanged at Pentonville Prison and his body buried in the prison grounds inspite of his request that his ashes be sent to Bharat. It was only in July 1974 that Udham Singh’s remains were exhumed and repatriated to Bharat at the persistent request of S. Sadhu Singh Thind, an MLA. His ashes received a tumultous welcome. 31st July is Udham Singh’s Balidaan Divas. This entry was posted in Nation and tagged Dwyer, Gen Dyer, Jallianwala Bagh, Udham Singh on July 31, 2010 by arisebharat.